Mass arrests of senior royals, amid fear of assassinations, indicate that what is going on in Saudi Arabia is a far-reaching purge. The facade of a “corruption probe” – promoted in part by Western news media and US President Donald Trump – is a barely credible cover. The cover is not just for a ruthless power grab within the desert kingdom by Saudi rulers, but a realignment that also puts the entire Middle East region on notice for more conflict and possibly even an all-out war with Iran. A war that the Israeli state and the Trump administration are enthusiastically egging on. This move towards war with Iran could explain why the Saudi royals made a landmark trip to Moscow last month. Was it an attempt to buy off Russia with oil and weapons deals in order to free the Saudi hand with regard to Iran? In typical fragmented fashion, Western media have tended to report the mass arrest last weekend of royal princes, ministers and business leaders, carried out under the orders of King Salman and his heir Crown Prince Mohammed bin Salman, as a crackdown on corruption and business sleaze. Omitted in media coverage is the significant wider context of the Saudi rulers moving at the same time to exert political control over regional politicians, as well as making sensational claims that Iran and Lebanon have “declared war” on Saudi Arabia by allegedly supporting a missile strike from Yemen. The apparent forced resignation of Lebanese premier Saad Hariri last weekend after having been summoned to the Saudi capital Riyadh provided convenient substance to Saudi claims that Iran and its Lebanese ally Hezbollah were destabilizing Lebanon and indeed plotting to assassinate Hariri. However, Hariri was just one of several regional political figures whom the Saudis were reportedly putting pressure on. Reports emerged that the ex-Yemeni president Mansour Hadi has been held under house arrest in his exile home in Riyadh. There were reports too of Syrian opposition figures being detained in Riyadh. And the Palestinian leader Mahmoud Abbas was ordered to the Saudi capital. This suggests the Saudis are orchestrating a regional chorus line. Furthermore, there were credible Israeli media reports that the government of Benjamin Netanyahu in Tel Aviv is coordinating with Saudi Arabia to support the latter’s accusations against Iran and Hezbollah of committing acts of war from Yemen by supplying missiles to the Houthi rebels. Washington has also weighed in to support the Saudi claims that Iran is arming the Houthis in violation of a UN Security Council resolution. Referring to the missile strike on Riyadh international airport last Sunday President Trump said that “Iran took a shot at Saudi Arabia”. Then the US ambassador to the UN Nikki Haley later in the week called for sanctions against Tehran, citing Saudi “evidence”. Iran has dismissed the claims as baseless, pointing to the Saudi air, sea and land blockade on Yemen as preventing any such weapons supply. The power behind the Saudi throne, Mohammed bin Salman (MbS), the 32-year-old son of ageing King Salman (82), has emerged as an ambitious autocrat who also harbors an intense hostility towards Iran. In several media interviews, the Crown Prince has disclosed an obsession with crushing Iran. This goes way beyond the usual sectarian Wahhabi antipathy of Saudi leaders towards Shia Iran. Crown Prince MbS is playing a smart game to a degree. He has made a big media play on “reforming” Saudi Arabia from its fundamentalist social conservatism to become a seemingly more cosmopolitan society. The Crown Prince has pushed reforms giving Saudi women the right to drive cars, travel without male guardians, and enter sports stadiums. Hardly radical advances in gender equality. Nevertheless, MbS has ably projected himself with Western media assistance as something of a progressive reformer. Those changes are but the veneer for ruthless ambitions and a hyper power-grab within the despotic House of Saud. The supposed “corruption probe” is another layer of varnish to conceal much more sinister developments. Britain’s Guardian newspaper this week waxed lyrical over the mass round-up of senior Saudi royals and ministers describing it as a “revolution” carried out by the would-be reformer Crown Prince, placing the development in the context of minor liberalization of women’s rights. Such reporting serves as a distraction from the real power play at work and the grave regional implications. For a start, the number of detained princes, as well as current and former government ministers, are in the dozens. The profiles of those arrested suggest a pattern that has more to do with eliminating potential rivals than with alleged corruption. Potentially most sinister is that on the day of the mass arrests, a contender for inheriting the Saudi throne was killed in a helicopter crash. Prince Mansour bin Muqrin (42) was among eight officials who died when their chopper went down in southern Asir Province near the border with Yemen. Saudi media have not given any details about the cause of the crash. One might have expected the Saudis to lay the blame on Houthi rebels and, by extension, Iran. But no. The House of Saud and its media outlets have said little about the death of this senior royal. Significantly, too, the Houthi rebels and their media have said little about the incident. If there was a chance of the rebels being involved, one might expect them to prompt a propaganda coup claiming a spectacular blow against the Saudis whom they have been fighting a war against since March 2015. Prince Muqrin was also a former head of Saudi state intelligence (2005-2012) before he was made Crown Prince in January 2015 upon the death of his brother, the late King Abdullah. In the arcane world of Saudi power inheritance, the throne has always passed between Ibn Saud’s sons, or from brother to brother. When Abdullah died in January 2015, the next in line was their brother Salman (the present king). After Salman, according to traditional succession rules, the next heir to the throne should have been Muqrin, who indeed was made Crown Prince in January 2015. However, three months later, King Salman demoted Muqrin as heir apparent. He was sidelined to make way for the emergence of Mohammed bin Salman, the son of the king, as Crown Prince. That marked an unprecedented rupture in Saudi royal tradition, and no doubt has left a seething resentment among the clans comprising the House of Saud. Prince Muqrin and his lineage of six sons, therefore, can be seen as a dangerous rival to the ambitions of Crown Prince Mohammed bin Salman. As his own father King Salman’s health declines, the next-in-line appears to be clearing the royal court of potential competition for the throne. It is not yet known what actually happened to the helicopter ferrying Prince Mansour last weekend. But it seems more than a coincidence that the crash occurred on the same day as the arrest and round-up of several other senior royals. Two of those arrested were Prince Mataib bin Abdullah and Prince Turki bin Abdullah. They are the sons of the late King Abdullah, and like Prince Mansour, they are cousins of Crown Prince MbS, and therefore could potentially mount a challenge to his succession to the throne. The arrests also targeted the heads of national security, the National Guard and Navy, as well as Western-connected Saudi media magnates Prince Al-Waleed bin Talal and Waleed Al-Ibrahim, who are major shareholders in 20th Century Fox, News Corporation, Apple, Twitter, and TV satellite companies. Those arrests suggest that Crown Prince Mohammed bin Salman is trying to close down any backlash from within the Saudi security establishment, as well as shut off potentially negative media coverage. Donald Trump immediately hailed the events in Saudi Arabia as a welcome clean-up against corruption. He said people had been “milking the country for years”. So, for Trump and sections of the Western media to indulge the notion of a reforming Crown Prince overhauling endemic national sleaze is impossibly naive. 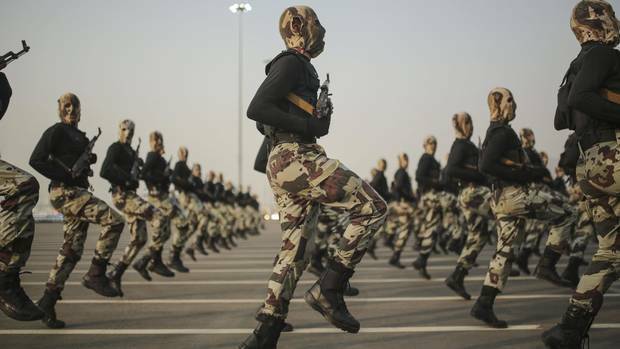 It also completely misses the point of how the Saudi rulers are gearing up for a regional war with Iran and via Lebanon by consolidating all power behind Crown Prince MbS and his anti-Iran obsession. Trump and his business mogul son-in-law Jared Kushner have from an early stage gravitated to Crown Prince MbS for massive US arms sales and Saudi investment in the American economy. Only days before the Saudi purge, Kushner was on a low-key visit to Riyadh to meet with Saudi rulers. Trump also appealed last week to the Saudis to choose US stock markets for the much-anticipated share sell-off for Aramco, the Saudi national oil company, which is expected to fetch $2 trillion. Crown Prince Mohammed bin Salman, the architect behind the Saudi slaughter in Yemen, is positioning himself with total power in order to pursue his obsession with confronting Iran. That’s like pushing an open door when it comes to forming an anti-Iran front with Israel’s Benjamin Netanyahu and the Trump administration. And for Trump, there is also the added incentive of lavishing Wall Street by pandering to the Saudi despots.